For the young electric vehicle charging market, variety is a good thing. Competition drives down costs and fosters technological improvements. Today, municipalities or private charging providers choose from a multitude of charging station manufacturers and network system vendors. This wide choice raises the question of interoperability, or, in other words, the ability of each EV charging station to communicate with a central system, regardless of manufacturer or IT back-end vendor. That’s where the Open Charge Point Protocol (OCPP) comes in. What is OCPP for EV charging stations? OCPP is an application protocol — a language that allows communication between a compliant charge point, like the EVLink range, and any central network system. an infrastructure that’s scalable and easy to operate both for EV drivers and network managers. With the OCPP, customers can integrate charging stations from several vendors into the same IT back-end system. They can also select the most appropriate charging station vendor(s) and the most appropriate IT back-end supplier independently. Promoted by the Open Charge Alliance, OCPP has become an increasingly popular protocol and a de facto standard in 50 countries and over 10,000 charging stations. Unlike proprietary communication protocols, OCPP is open and unassociated with any licensing cost or requirement, making it easy to adopt. Adopted by many charge point vendors and central system suppliers, OCPP-compliance is now becoming a “must-have” requirement among investors. They see it as a way to keep their infrastructure vendor-neutral and to reduce costs. Relying on OCPP to build or expand an intelligent charging infrastructure is easier said than done. To fully experience the benefits of OCPP, organizations need a proven implementation process that involves design reviews, tests, and validation. That is why there’s a growing need for complete implementation and reliable supporting services that ensure back-end interoperability. Schneider Electric’s EVLink Parking charging station solutions are now compliant with OCPP v1.5. They give customers the ability to manage their EV charging infrastructure at a single point level (one charging station) or at a cluster level, supporting one of the most comprehensive OCPP functionalities in the market. Schneider is also able to offer a turnkey solution that includes OCPP-compliant charging stations and an IT back-end system for electric vehicle charging. To enable OCPP back-end compatibility and high customer satisfaction, Schneider Electric experts provide a proven validation process that supports the upgrade of existing infrastructure and installation of new equipment. This process has already helped many customers achieve comprehensive back-end interoperability with seamlessly integrated and reliable EV Link charging stations. Kudos to Schneider for adopting the only open standard protocol in the industry. Only through a truly open OCPP implementation which allows hardware choice and network portability will we all succeed in securing the future of electric vehicles. 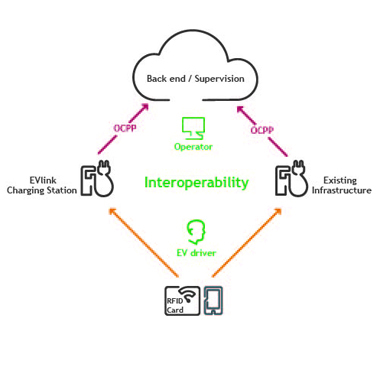 EV Connect is proud to say that we have already tested against the Schneider OCPP 1.5 implementation and can certify that we are capable of managing their stations in workplace, municipal, fleet and parking environments. With the advent of OCPP1.6, are the EVLink devices compatible with this new version? If not, when do you expect this functionality to be available. Thank you. OCPP is only available on our smart charging stations (ie. Smart wallbox, parking, and city and not regular wallbox). For our IEC (European) chargers are compliant with OCPP 1.6 as of mid-2017. This February we also added smart charging features. Our UL products (North America) are not compliant with OCPP. We will reach out to you with more information.